Catherine Amelink – Assessing Changes in Entrepreneurial Mindset Among Faculty and Students. Michael J. Kutnak – Creating a Master Transition Plan for Virginia Tech. Sophie Wenzel – Virginia Tech Faculty and Staff Tobacco Free Campus Policy Assessment. Jack Evans – Assessing Active Learning in Introductory Biology Courses. Given my interest in using Google Apps to support teaching, I found the talk by Jack Evans on the ‘flipped classroom’ model being advanced for their freshman Biology Course of particular interest. I believe there is an opportunity to leverage different Google Apps to support their new model of student engagement/learning and reduce the burden of administering the class via the VT Scholar system. In particular, I believe Google Drive, a (private) Google+ Community, Google+ Circles, Google Docs (for co-creating work), and Google Classroom (to administer assignments) could be set-up as an integrated platform for the ‘flipped classroom.’ I also believe Apps like ParticiPoll could be used effectively for in-class polling (or quizzes), which would replace the current use of clickers. Other Apps like Splashtop could also be an effective way to enable instructors to control their laptops remotely from an iPAD, tablet, or smartphone. I plan to follow-up with Jack’s team in the near future to discuss these ideas and to learn more about their teaching model. I also plan to develop a wishlist of Google Apps functions that could enhance the use of this platform in a teaching environment. I’ll post the list here when its ready. 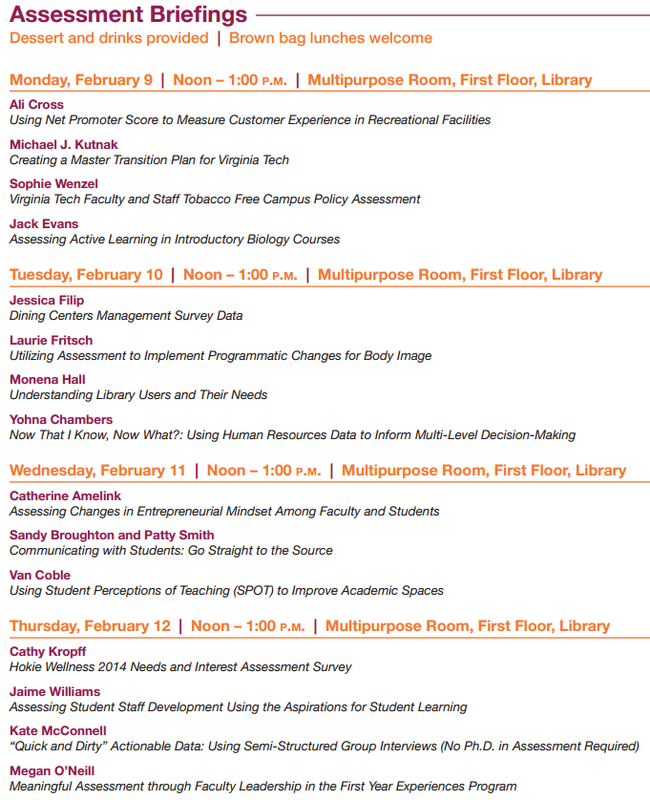 Posters from the Assessment Showcase speakers will be on display all week in Newman Library with a live “popcorn and posters” session on February 13 from noon – 2:00 p.m. I encourage anyone on campus to drop by the event to learn more about the various assessment activities that are underway at the university. The photos below were taken during the event using Google Glass.